All eyes will be on Manchester City during the FA Cup Semi Final Weekend this coming April. The matches will take place at Wembley Stadium over the weekend of 6th & 7th April. Saturday 6th April sees Manchester City vs Brighton in the first of the two semi-final matches. On Sunday 7th April Watford take on Wolves. 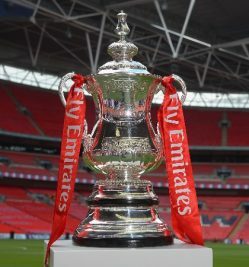 The FA Cup forms part of the quadruple trophies Manchester City are chasing in the 2018/19 season. This match is likely to draw a large crowd of enthusiastic fans, here at TST Cars we have a range of London chauffeur cars available to take you and your guests to and from the match. Manchester City reached the FA Cup Semi Finals after a dramatic match with Swansea City. Coming from two goals behind to beat Swansea in the closing minutes of the game with a goal from their talisman Sergio Aguero in the 88th minute. Brighton’s match against Millwall ended just as dramatically as that of the Man City match. Brighton’s opponents Millwall had been leading the match at the Den after scoring two goals in the 70th and 79th minute. However Brighton substitutes Jurgen Locadia (88th minute goal) and Solly March (scoring a 95th minute penalty) had other ideas. The drama continued in extra time when Millwall had a goal ruled out before the match went to penalties. Milwall’s Jake Cooper missed the 12th penalty of the shootout to send Chris Hughton’s team through to their FA Cup Semi Final match against Manchester City. Brighton can also take some comfort in that they beat Manchester City 4-0 on the way to the 1983 FA Cup Final. The second FA Cup Semi Finals take place on Sunday 7th April between two of the most improved Premier League teams. Javi Graci’s Watford take on Nuno Espirito Santo’s Wolves. Watford reached the semi-finals without the dramas of either Man City or Brighton. After a relative straight forward win over Crystal Palace. Watford scored first through Etienne Capoue’s in the 27th minute. Crystal Palace’s Michy Batshuayi levelled the match at 1-1 just after the hour mark. The game stayed finally poised before Andre Gray’s strike took the Hornets through to only their sixth FA Cup semi-final appearance. Watford’s opponents Wolves sealed their place in the FA Cup Semi Finals with two late goals in the 70th and 77th minute of my match against Manchester United. Although Man United pulled a goal back in the 95th minute of the match through Marcus Rashford it wasn’t enough. Ole Gunnar Solskjær’s team looked stunned to have been knocked out of the competition after their recent run of good results. If Manchester City don’t get to this years final the winner of either the two other FA Cup Semi Finals are going to say what a great chance of winning the FA Cup.” This is the beauty of the game…. Whether you support, Manchester City, Brighton, Watford or Wolves the FA Cup Semi Finals weekend will be a fabulous day out at the home of English Football. Here at TST Car Services we are able to offer a range of competitively priced London chauffeur cars to take you and your guest’s to and from either of the two FA Cup Semi Final matches on Saturday 6th and Sunday 7th April.